Please join us for the Burton Race Series. It is easy to participate, just complete any three of the four running/walking events in the series. Register for each event individually and Newton Timing & Race Services will keep track of your participation. At the conclusion of the series, each finisher will receive a great series medal courtesy of Hurley Medical Center. 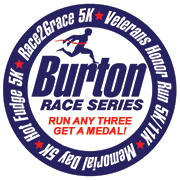 There are fees to register for each event, but there are no additional fees for inclusion in the Burton Race Series or to receive a series medal. Each person completing three of the four series events will receive a free custom designed Burton Race Series medal courtesy of Hurley Medical Center. Medals will be distributed at the Veterans Honor Run. If you are unable to attend the Veteran Honor Run and receive your medal, they will be available at Complete Runner beginning Monday, November 4, 2019. The address is 915 S. Dort Hwy., Flint, Michigan. Hurley Medical Center is the Official First Aid Provider of the Burton Race Series. Hurley has partnered with organizations to offer free flu shots to participants and volunteers at the Veterans Honor Run. This is simple. Register for three of the four events and complete them. Please spell your name the same in each event to assist in documenting your participation. 1) To promote year-round fitness and a healthy lifestyle. 2) To socialize with family and friends while having fun. 3) To support community events and fundraising efforts. 4) And of course, to receive a great Participant Medal!